Engraving depicting the death of King Arthur, based on an 1869 painting by Joseph Noel Patton. Fortean Picture Library. The stories of King Arthur and the Knights of the Round Table can be read on many levels. They are, at the very least, entertaining adventure tales. On a deeper level, they are a rich mythological source, examining the depths of human nature from ancient Celtic myth to medieval Christian values. Certainly there are those who read them to discover more about what was going in the historical period in which they were written. But fascinating insights can also be derived by reading them from a religious perspective. Arthur is portrayed as a hinge between two worlds. Assisted by the wizard Merlin, who is perhaps a Druid, Arthur stands as the last of the pagan kings, but with a foot in the Christian world as well. Seen in this light, the Arthurian legend is the story of all the gods becoming one God, of pagan Europe being transformed to Christianity. When young Arthur draws Excalibur from the stone, he is freeing the source of magic from the dark, hard places of the earth and exposing them to work in the air and light of day. He never really becomes a Christian, however, so at his death the sword, having done its work, is returned to the Lady of the Lake, the goddess. The sword is represented now by the many pagan customs "baptized" or adapted and wielded by Christianity. Easter celebrations, bunnies and eggs, Christmas trees and lights— all are examples of Excalibur, still flashing in the light of triumphant Christianity. But rest assured, the legend reminds us, that when the male God of Christianity has done his work, the sword will be returned to its rightful owner, the goddess, who has been the real source of power all along. In the fifth century, Rome was pressured to draw its legions back from England to protect itself from the Barbarian hordes nipping away at its borders. The Pax Romana, or Peace of Rome, was removed. It had been a peace enforced by the sword, but a peace nevertheless. The crust of Roman civilization in Britain began to crumble under invasion from without and rebellion from within. Christianity had been the official religion of Rome, but it had never managed to eliminate the pagan religion that had been at the heart of the people of Britain, who now looked for protection so they could plow their fields and support their families. They needed leadership. But they were also searching for spiritual nourishment. Many had adopted the new religion but would not forsake the old. The shrines of roadside gods still held peasant offerings. 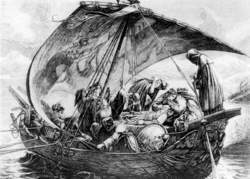 Christian bishops battled pagan priests for the soul of Britain, and both needed political protection from Saxon ships pillaging their shores. This is the drama into which Arthur, if he ever lived at all, was born. His birth and ascension were magical. Merlin, the mysterious, shadowy background figure, seems to be at home in both mystical Avalon and the castle of Camelot, a Druid who has elements of Mithras, the soldier's god, and Christ. He is, of course, suspected by all and accepted by none but Arthur, but his magic and insight guide the young king to establish, for a short time, an empire open to all. By the time of the Middle Ages the stories take on a distinctly Christian aura with the Grail legends. The Holy Grail was the cup from which Jesus drank at the Last Supper. Brought to England, some say by angels, others by Joseph of Arimathea, it was hidden away, to be found only by the pure of heart. At this point it is important to remember that the Grail legend predates Christianity by centuries. Celtic lore refers to several magic cauldrons that heroes undergo quests to find. It was another pagan myth that, like the Christmas tree, the Easter bunny, and the Yule Log, was "baptized" by the church to incorporate pagan customs the people refused to abandon. But to study the Grail legends is to delve into the very heart of religion and human psychology. Galahad, who achieved the quest, becomes a study of purity and noble purpose. Thirteenth-century German poet Wolfram von Eschenbach's Parzival discovers the Fisher King (keeper of the Holy Grail), drinks from the Grail, and becomes the Grail King himself. When he is baptized by its water, an inscription appears on the cup: "If any member of this community should, by the grace of God, become the ruler of an alien people, let him see to it that they are given their rights." Joseph Campbell believes this to be the first time in history that such a thought was expressed. The idea that a king must rule in the name of his people, rather than in his own name, didn't come to fruition until the signing of the Magna Carta in 1215. When Parzival meets a hermit he is told, "You, through your tenacity of purpose, have changed God's law." The idea of a human being wrestling with God and winning is new to Christianity, although the Hebrew Bible tells the story going back all the way to Jacob in the book of Genesis. We see here the concept of evolving religion. Paganism is enveloped by Christianity. Christianity adapts to the importance of the individual over the divine right of feudal lords. I carried the nine lamps out of the chapel. Come daylight, I would take them where they now belonged, up to the caves of the hollow hills, where their gods had gone... my sight blurred and darkened as if still blind with vision, or with tears.... The tears showed me the altar now, bare of the nine-fold light that had pleasured the old, small gods; bare of the soldier's sword and the name of the soldier's god. All it held now was the hilt of the sword standing in the stone like a cross, and the letters still deep and distinct above it: TO HIM UNCONQUERED. If any faint spark of his ancient fire still lingered in Arthur, it was through Mr Shute that it must be fanned. So carefully did she toil that she was still busy when Arthur, taking off his apron and putting on his hat, went out for his twenty-minutes' lunch, leaving them alone together. I didn't know but that perhaps somebody might be passing up or down the stairs,' said Arthur Gride, after looking out at the door and carefully reclosing it; 'or but that your man might have come back and might have been listening outside. Coming close to Arthur, he said, "My friend Arthur, you have had a sore trial, but after, when you look back, you will see how it was necessary. From this time Arthur constantly spoke of his home, and above all, of his father, who had been dead about a year, and whose memory Tom soon got to love and reverence almost as much as his own son did. All that, Arthur had laid his account to give, and took as a matter of course, neither pitying himself, nor looking on himself as a martyr, when he felt the wear and tear making him feel old before his time, and the stifling air of fever-dens telling on his health. You understand that there was a great deal of strong language, mingled with soothing "who-ho's" while the leg was examined; that John stood by with quite as much emotion as if he had been a cunningly carved crab-tree walking-stick, and that Arthur Donnithorne presently repassed the iron gates of the pleasure-ground without singing as he went. As for any real harm in Hetty's case, it was out of the question: Arthur Donnithorne accepted his own bond for himself with perfect confidence. All perfectly true,' observed Arthur, 'and all sufficient reasons for going. I require a deal of pulling through, Arthur,' said Mr Meagles, shaking his head, 'a deal of pulling through.